Greenwich, CT – (June 20, 2017) – It happens more than you imagine. A high-flying executive makes a fateful decision and winds up in legal trouble. He’s sentenced to time in prison and his life and the lives of his family are shattered. 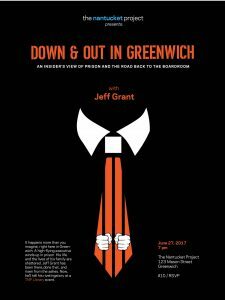 Next week, The Nantucket Project presents Down & Out in Greenwich: An Insider’s View of Prison and the Road Back to the Boardroom. On Tuesday, June 27 at 7:00 PM, Jeff Grant will share his story about prison life and his difficult road back to life after incarceration. TNP Library, 123 Mason Street, Greenwich. Grant was a Main-Stage Presenter at The Nantucket Project in 2013.
life, personally and professionally, and was recently named the Executive Director of Family ReEntry, a nonprofit leader that supports families affected by the criminal justice system. He has been the subject of articles in regional and national media and has received numerous business and service awards. opportunity to achieve, learn and grow as citizens who are not forced to return to the kind of activity that caused them to be incarcerated in the first place,” said Grant. About The Nantucket Project: Led by co-founders Tom Scott (who also created Nantucket Nectars and the HBO television series “The Neistat Brothers”) and Kate Brosnan, TNP brings live events, short documentary films, and meaningful storytelling to audiences hungry to know what matters in our noisy and messy world. Past presenters have included Tony Blair, Steve Wozniak, Deepak Chopra, Hope Solo, Norman Lear, Christy Turlington Burns, Mellody Hobson, Neil Young, Seth Godin, Eve Ensler, Julie Taymor and Paul Giamatti. Visit https://www.nantucketproject.com/to learn more.